Posted byGalen Charlton	 15 June 2017 22 June 2017 3 Comments on What makes an anti-librarian? Am I hoping that the librarians made of anti-matter will wear these ribbons to identify themselves, thereby avoiding unpleasant explosions and gamma ray bursts? Not really. Besides, there’s an obvious problem with this strategy, were anti-matter librarians a real constituency at conferences. But I’d like to unpack Beall’s choice of the expression “anti-librarian”? What exactly makes for an anti-librarian? We already have plenty of names for folks who oppose libraries and librarians. Book-burners. Censors. Austeritarians. The closed-minded. The tax-cutters-above-all-else. The drowners of governments in bathtubs. The fearful. We could have a whole taxonomy, in fact, were the catalogers to find a few spare moments. “Anti-librarian” as an epithet doesn’t fit most of these folks. Instead, as applied to a librarian, it has some nasty connotations: a traitor. Somebody who wears the mantle of the profession but opposes its very existence. Alternatively: a faker. A purveyor of fake news. One who is unfit to participate in the professional discourse. There may be some librarians who deserve to have that title — but it would take a lot more than being mistaken, or even woefully misguided to earn that. What makes an anti-librarian? by Galen Charlton is licensed under a Creative Commons Attribution-ShareAlike 4.0 International License. I agree with Rachel Walden, and would add that misguided Academic Deans, Provosts, CFOs, etc., pose more of a threat than predatory publishers. 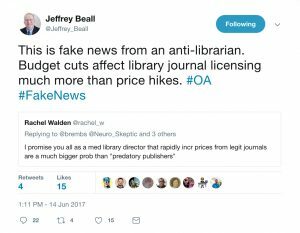 I suppose it is his belief that OA means the end of libraries. If so, he has a very narrow view of what libraries are.